Description: 931 heads through the south end of Bevier St yard behind three CN units, a pair of WC units, and one of a kind NS 3329, the unit painted for Maersk Lines. 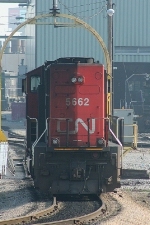 Description: CN 5662 leads long mixed freight Eastbound on CN Rivers sub. Description: Under the signals and heading NW on the IHB main. Close that damn door! Description: A GEC Alstrom leaser was tucked in there.. Description: Same consist as a few days ago, just with an IC added on. Title: CN A40611-02 at Lower Mtn. Rd. Description: CN Engine 5662 charges across Green Wood Street running light. The next car to pull up to this crossing almost rear ends that Chevy. Description: CN Engines 5662 & 2567 charge across Green Wood Street running light. The next car to pulling up to this crossing just of of frame to the left almost rear ends that Chevy. Even anti train people shud see something that big crossing the road. Description: Two CN units roll light back into The Elucid yard. Description: CN Engine 2567 leads L540 out of The Elucid Yard as she approaches The Cooper Lake Cut across Rd. Description: CN Engines 2567 & 5662 lead L540 out of town. With 34 cars behind them. Description: CN Engines 2567 & 5662 lead L540 with 34 cars across The Peshekee River Bridge. Description: CN Engines 2567 & 5662 lead L540 towards L'Anse near Brown Rd. On a beautifull winter afternoon.